Manufacturing processes that use hot melt drum unloaders include roll coating, cable manufacturing, spray coating, and hand application. So how much can you expect to invest in a complete hot melt drum unloader system? Of course, it depends on the specific application method and application parameters. Some complex, multi-drum, high-volume systems can sell for as much as $1 million, but that is unusual. Most new systems will sell in a range of US$40,000 to US$80,000. Hot melt drum unloaders (DUs) are manufactured for melting and pumping material from either 5-gallon or 55-gallon drums. This article focuses on the latter. DUs cannot pump from ridged drums. 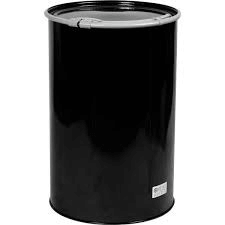 DUs are designed for straight-sided drums with a 22-½” inside diameter, so if your material is not packaged in this way, you will need to ask your material/adhesive supplier to make that change. Either fiber or straight-sided steel drums can be used. Fiber drums are less expensive, but they cannot be reused. Also, a fiber drum often requires a “clamshell” jacketing to be secured around the drum to prevent it from tearing or bursting as the platen moves through the drum, so that adds to the DU expense. There is a big difference in clamshell design from one manufacturer to the next. Some clamshells are mostly aesthetic. They add minimal structural integrity to the drum. Other clamshells are incredibly robust and will allow a fiber drum with a hole in it to be processed, even with 20 tons of ram force. You can expect the clamshell to add $0 to $10,000 to the cost of a system. The material viscosity is sometimes the biggest determinant of the final system cost. The viscosities of hot melt materials are high at ambient temperature, and they decrease as the material is heated. 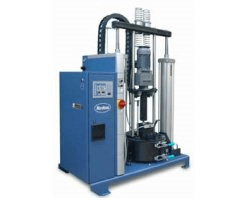 Most hot melt materials have a viscosity in a range of 5,000 to 50,000 centipoise (cp) at application temperatures, but one manufacturer has successfully pumped materials with viscosities as high as 2 million centipoise. It takes heat and pressure to pump high viscosity materials. 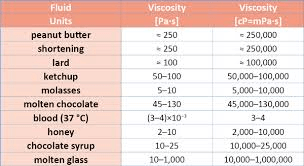 The higher the viscosity, the more heat, and pressure are required. Pressure is created by the downward force on the heated platen or the ram force. Most DUs use a pneumatic ram that can generate up to 2.5 tons of downward force. This is sufficient for most applications. However, highly viscous materials (usually over 100,000cp) often require more ram force. In this case, the manufacturer will use a hydraulic ram. Depending on the configuration, a hydraulic ram can generate from 8 to 20 tons of ram force. The base investment amount of a pneumatic system is typically $40,000 to $50,000. The base price of a hydraulic system will be well over $100,000. Application temperature is the second factor in cost. Most hot melt materials are applied at temperatures in a range of 300º – 350ºF. The platen temperature is always higher than the application temperature, so most applications require a platen temperature in a range of 350º – 400ºF. Some highly-viscous materials require much higher temperatures to lower the viscosity enough for pumping. In this case, a high-temperature (up to 500ºF) platen must be used. Expect to pay an extra $10,000 for the high-temperature capability. Production rate is another important price determinant. How fast do you need to pump? Do you need a continuous operation, or is a 5-minute interruption acceptable for a drum change? Will you need one “feed hose,” or two? If you are using a low-viscosity hot melt that only needs to be pumped at 100 lbs/hour, any drum unloader will meet your production rate requirement. However, if you are seeking to get the highest pump rate for your dollar, you should choose a DU that uses a machined platen. Most manufacturers produce their platens via castings, but one manufacturer fully machines its platens. The machining process enables them to get 6,000 square inches of heat transfer surface, or about double that of any cast platen. With more surface area, you can get more heat into your hot melt adhesive, much faster. That means higher melt rates and higher pump speeds. For example, if you wanted to heat a pan of water, which would heat it faster: a 400º burner that is 3” in diameter, or a 400º burner that is 6” in diameter? 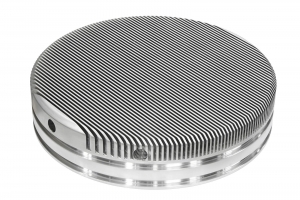 The burner with more heat transfer surface will heat faster, and the same is true for platens. Most drum unloaders will be able to pump a Pressure Sensitive Adhesive (PSA) at rates of about 300 lbs/hour. With a machined platen and a pneumatic ram, you will typically see pump rates of 500 – 600 lbs/hour on a PSA. Pump rates on other materials can vary widely, so you should check with your adhesive supplier to see what is most practical. It typically takes 3 to 5 minutes to make a drum change. That’s how long it takes to raise the platen out of an empty drum, remove the drum, insert a full drum, lower the heated platen into the drum, and then bleed any air from under the platen before returning the DU to the “run” state. Some production operations need to run continuously, and even a short interruption in material flow is unacceptable. In this case, you would run two DUs in tandem. When the first DU becomes empty, flow is automatically switched to a second DU. The material is always pumped from only one drum, but drum changes can now be made without interruption. This tandem system will be the price of two drum unloaders, plus extra hoses and a heated manifold. The cost can vary widely depending on the length, diameter, and rating of the hoses, but a typical application might be (2) x (DU Cost) + $10,000. If you need more flow than a pneumatic DU can deliver, you can get a much higher pump rate by using a DU with a hydraulic ram and/or a high-temperature platen. Additionally, manufacturers offer systems that can feed material from 2 or 3 drum unloaders at the same time to achieve the desired output. With these configurations, pump rates of 2,000 lbs/hour can be achieved with a PSA. It is not unusual for these multi-DU systems to cost $500,000 or more. Drum unloaders are used to feed material to slot extrusion dies, heated roll coaters, screw extruders, cable manufacturing machines, automatic dispensing stations, or handheld applicators, among many others. Some applications require the hot melt material to be filtered and/or precisely metered, which can also add significant cost. 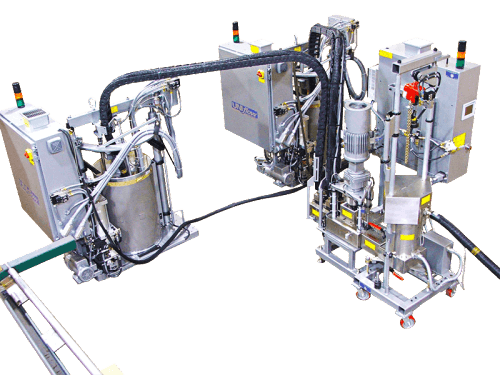 Slot extrusion dies are fed pressurized adhesive from a reservoir or directly from the DU. With a reservoir, a level sensor in the reservoir is used to control the drum unloader, calling for the DU to run when the adhesive level gets low and to stop when the adhesive level gets high. Generally, no additional options are required for this straightforward application. Adhesive is often dispensed into roll coaters with a heated manifold that is slightly less than the width of the heated roll coater rolls, and will typically have 1 to 6 application points per roll. You can expect to pay $2,000 to $6,000 for the manifold. If you are applying adhesive into an upper and lower roll coater, you will need two manifolds, plus a second hose. Drum unloaders connect to an extruder with a high-pressure hose and a heated ball valve. This can easily add $10,000 to the system cost. It could be more, depending on the hose diameter and length. If filtration and precise metering are also required, you can expect the system cost to jump another $70,000 to $200,000, depending on production rates and complexity. 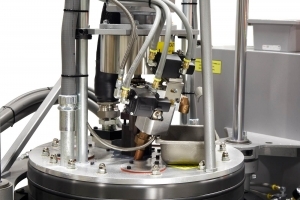 Automatic dispensing applicators, often used in automated insulated glass assemblies, simply require a heated ball valve at the dispensing point. The cost is typically around $2,000. Handheld bead extrusion applicators are often used by insulated glass manufacturers to dispense a bead of butyl around the perimeter of the window structure. A handheld applicator adds about $2,500 to the cost of a system. Some hot melt materials might emit offensive or potentially toxic fumes when the heated platen is raised from a drum. In these cases, an exhaust shroud is recommended and is typically connected to an existing ventilation system. An exhaust shroud can add $0 to $6,000 to the cost of the system. When drum unloaders are used, they are always a critical part of the production operation. If the DU fails, you could be losing thousands of dollars per hour in lost production. Hence, saving a few thousand dollars on the original purchase price is not always the best decision. How long has the system been in service? How often does the system require unplanned maintenance? How much do you spend annually on maintenance parts? How long does it take for your supplier to deliver critical parts? How well does your supplier respond when you need him? Drum unloaders use a piston pump or a gear pump to move material from the drum to your production process. A piston pump is a little less expensive up front, but it is far more maintenance intensive. To improve the reliability and lower the maintenance cost of your DU, always choose a gear pump. Pay attention to the specific seal design on the drum unloader platen. These seals prevent any hot melt material from slipping past the platen as it is lowered into the drum. A leaky seal is no fun. When there is a complete seal failure, the platen will “bury” itself in the adhesive. Getting the platen extricated from the drum, and then cleaning it, is exceptionally labor-intensive. You can avoid this by making a visual inspection of the seals with each drum change. You can get longer seal life by choosing the patented Seg-O-Seals, that are designed to “roll” into a dovetail groove. Some manufacturers even offer a leak detection option. This option will sense when the material gets passed the seals and reaches the top surface of the platen. The system will sense the leaked material on the platen and shut off the drum unloader. Now, the seals can be replaced before it becomes a major problem. Leak detection can be added for about $5,000. The added cost of a gear pump and Seg-O-Seal is minimal, but these will save you a lot of money over the life of the machine. One of the best ways to improve productivity is to reduce maintenance and downtime (see previous section), but there are other ways to improve productivity. Once you have optimized the melt and pump rates on your system, the only productivity loss is from drum changes. This can be eliminated completely by using a tandem DU configuration, or a multiple DU unloader configuration, as described in Section 4 above. But what if you do not need a continuous operation and do not want the added expense of a multiple-DU system? 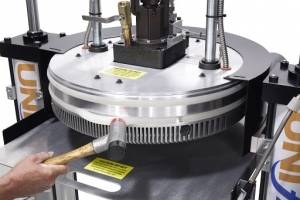 There are features you can choose to reduce your drum change time. This has already been recommended, but choose a drum unloader that has a machined platen. Why? Part of the drum change time is bleeding the air after lowering a platen onto a new drum of hot melt material. You cannot bleed the air until you create a melted pool of adhesive under the platen. The greater surface area of the machined platen will heat material faster. Hence, you get a “melt pool” faster, and you can complete the bleed process in much less time. Here is another way to reduce the drum change time. 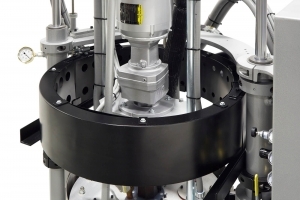 Upgrade the system to include a “position sensor” that will sense the exact platen position. This upgrade is normally chosen when a customer wants to capture real-time information on their pump rates. However, adding this feature will reduce drum change time, too. When the platen reaches the bottom of the drum, the DU automatically goes into “boost mode” that raises the platen until it reaches a “park position” that is located immediately below the top of the drum. No one wants to nor should cut corners on safety, especially when working around a machine that is designed to heat adhesives and other materials to a HOT molten state. Always wear protective apparel and follow all manufacturer’s warnings when operating or working on drum unloaders. With that said, are there options you can buy that will improve operator safety? Absolutely. We have talked about the bleed process that is performed with each drum change. All DUs come standard with a manual bleed/boost valve. Each manufacturer has their own design on how the bleed is performed at the beginning of a drum, or how the boost is achieved to move the platen out of an empty drum. Still, with a manual bleed/boost valve, the operator has to work near the heated platen to open and close the manually operated bleed valve, as required. Some manufacturers offer a semi-automatic bleed/boost function. Instead of a manual valve, the bleed/boost is controlled with a solenoid valve that is operated from the HMI touchscreen. The operator is able to remain at a safe distance while performing the bleed or boost process. Most large companies with advanced safety protocols will not consider purchasing a machine without this important safety feature. The cost is typically less than $6,000. If a clamshell is needed for the application, take a close look at the type and quality of construction. Is it a full clamshell, or a half-height clamshell? What is the thickness of the clamshell material? Is the clamshell held together with flimsy clamps, or with hardened c-clamps? If you are considering a drum unloader with a hydraulic ram, this is particularly important. Making a drum change takes more time when there is a clamshell, and it is particularly time-consuming when using a high-force hydraulic ram (13+ ton). These require (5) hardened c-clamps to ensure the clamshell will hold the drum firmly, even if the drum is split. When tightening the c-clamps, they should be tightened much like you tighten the lug nuts on a wheel on your car. You loosely tighten each clamp, then tighten each clamp a little more firmly, and finally tighten each clamp securely. When an operator is working quickly, he could be tempted to skip a step and not securely tighten every clamp, and that’s dangerous. Fortunately, there is a solution that removes this risk and also improves productivity. You can order a hydraulic clamping option that enables the operator to open or close all (5) c-clamps from the touchscreen in only 7 seconds. This is an expensive option, but the added safety and productivity is well worth the cost. The typical cost for a pneumatic hot melt drum unloader ranges from $40,000 to $80,000. Most systems, even with improved safety features, will sell for $50,000 to $60,000. Still, some high-volume systems or those that need to pump extremely viscous materials can easily sell for more than $200,000. Making an investment in a semi-automatic bleed/boost package will improve both safety and productivity, and is well worth the cost.